People in East India and Bangladesh consider the hilsa fish to be the tastiest among fishes. 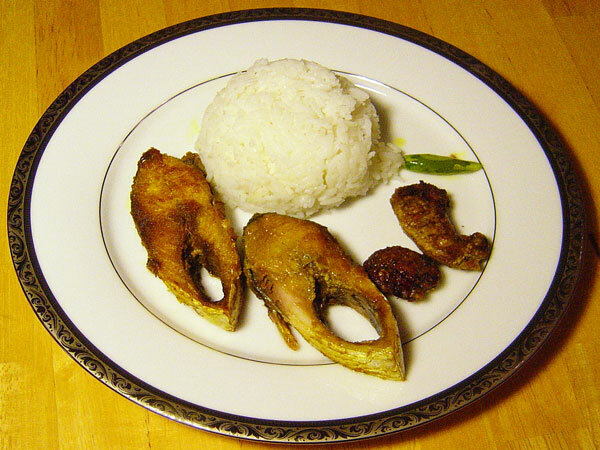 And the fried hilsa fish with steamed hot rice is a favorite dinner item. The preparation consists of 3 steps. 1. In step one, the mustard seed will be ground with spices to create the sauce. 2. In the second step this sauce will be used to marinate the fish. 3. And finally, the marinated fish will be cooked. 7. If it is too dry, you may have to add some more water to create a thick paste or the consistency you want. 17. Add a teaspoonful of oil to a medium hot pan. The purpose of this oil is to ensure that the fish pieces do not stick to the hot pan. 25. Then stick a fork into the fish to see if the fork passes through them easily. This indicates the cooking is done. 26. Turn off the heat and cover the pan.